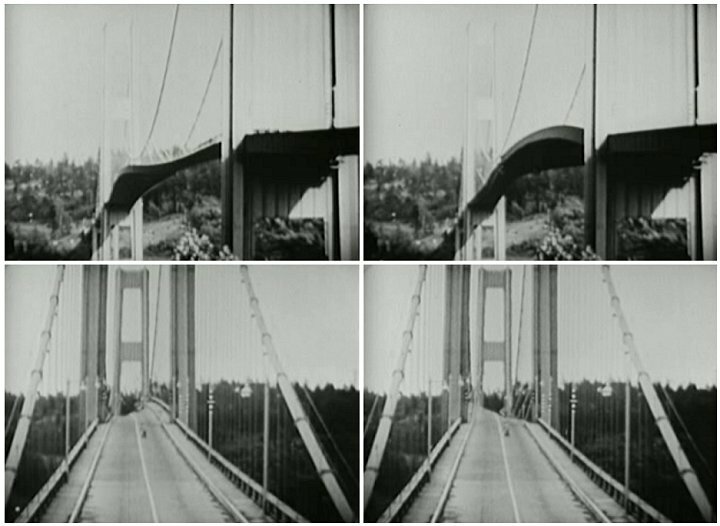 Let's now examine the more conceptually difficult case of the Tacoma Narrows Bridge. The surprise here is that the wind was steady. If the wind was blowing at constant velocity, why did it shake the bridge back and forth? The answer is a little complicated. Based on film footage and after-the-fact wind tunnel experiments, it appears that two different mechanisms were involved. A cross-section of the bridge. Swirls of air are forming and being shed from the trailing edge. The first mechanism was the one responsible for the initial, relatively weak vibrations, and it involved resonance. As the wind moved over the bridge, it began acting like a kite or an airplane wing. As shown in the figure, it established swirling patterns of air flow around itself, of the kind that you can see in a moving cloud of smoke. As one of these swirls moved off of the bridge, there was an abrupt change in air pressure, which resulted in an up or down force on the bridge. We see something similar when a flag flaps in the wind, except that the flag's surface is usually vertical. This back-and-forth sequence of forces is exactly the kind of periodic driving force that would excite a resonance. The faster the wind, the more quickly the swirls would get across the bridge, and the higher the frequency of the driving force would be. At just the right velocity, the frequency would be the right one to excite the resonance. The wind-tunnel models, however, show that the pattern of vibration of the bridge excited by this mechanism would have been a different one than the one that finally destroyed the bridge. The bridge was probably destroyed by a different mechanism, in which its vibrations its own natural frequency of 0.2 Hz set up an alternating pattern of wind gusts in the air immediately around it, which then increased the amplitude of the bridge's vibrations. This vicious cycle fed upon itself, increasing the amplitude of the vibrations until the bridge finally collapsed. These are four screen shots of a movie taken by an unknown photographer. The time difference of the left and the right images is only a few seconds.